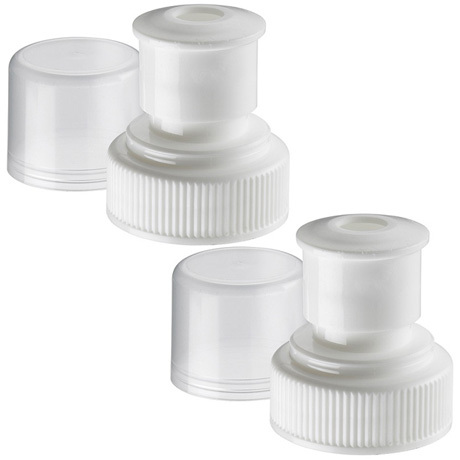 Platypus Push-Pull Caps (2 Pack) - Now Only $2.95! Use hot, soapy water and rinse thoroughly with hot water. For tough cleaning jobs, add 1/4 cup of baking soda to 3/4 cup of water per liter volume of your bottle and shake for 30 seconds. Add 1/4 cup lemon juice, shake 10 seconds, and vent by loosening cap away from face. Repeat shaking and venting three times. Expel as much air as possible, cap bottle, and allow to soak 20 minutes. Rinse three times with hot water. Caution: When adding lemon juice to baking soda, effervescence occurs and will cause pressure to build in a capped Platypus product. Platypus bottles can be dried by blowing a little air into them to expand them and letting them stand uncapped until the water evaporates. Another great way to dry bottles is with a plastic bag dryer, widely available at kitchen supply stores and numerous online retailers. Can I put other beverages in my Platypus bottle? 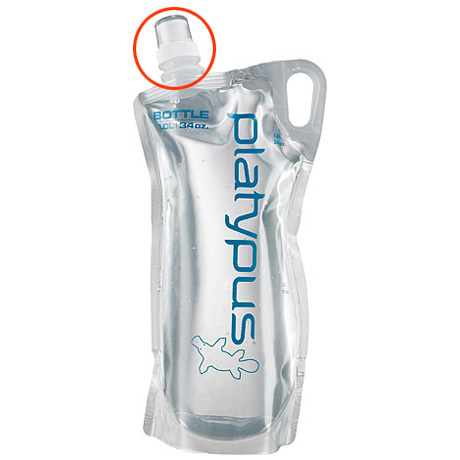 You can put a variety of beverages in your Platypus bottle. Just make sure you clean it thoroughly after each use to prevent bacteria from growing in the bottle and/or tube. Is it ok to freeze my Platy bottle? Yes. A frozen Platy bottle makes a great ice pack and, during the dog days of summer, delivers a steady source of cold, refreshing hydration. Lay it half-full on its side in freezer with all air purged. Do not over-fill. Water expands as it freezes and this can burst your bottle. To disinfect, fill the bottle with solution of unscented household bleach and water at a concentration of 1 oz. of bleach per liter of water. Close and mix for 10 seconds. Fill hoses and bite valves by squeezing bite valve, being careful to keep valve over sink. Leave filled overnight. Rinse thoroughly and air dry. For a more planet-friendly alternative, use a chlorine-free, hydrogen peroxide-based bleach alternative like Free and Clear available from Seventh Generation.